July 26, 2013: Unlocked Faris. She has high Agility. July 27, 2013: Maxed out Firion’s level. Almost all of his stats were star-rank at the end. Replaced him with Lightning because of her high Strength. Trophy: Watched 100 extended versions! I got a Gray Shard finally. I like how you can put the 3DS into sleep mode but still hear songs in the Music Player. November 30th 2009: The title screen has a visual filter that looks different from any other part of the game so far. 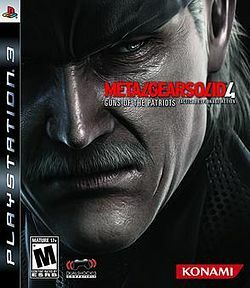 Snake surmised that Solidus’ fear of the Patriots’ control of the media and economy came to pass. But Liquid planned to oppose them. Campbell suspected that we may have to “protect the System” to maintain the comforts of the modern age. The octopus woman and Vamp protected the base where Naomi was supposedly held. “Snake… isn’t here,” said the laughing octopus before she slaughtered some PMC soldiers in Snake’s guise. November 3rd, Part Two: One constant in MGS are the Easter eggs. References to MGS games, other Hideo Kojima games, and other Konami games. The first reference I noticed was in the Act One briefing. One of Otacon’s desktop images is from Zone of the Enders: The Second Runner. I was surprised that Snake brought his iPod with him. You can find tracks from other Metal Gear games throughout MGS4. They even come with some trivia. Snake’s iPod also comes with an in-game podcast. So far, I’ve tried to be more stealthy here than in the other MGS games. I’ve mainly used the Stun Knife and Mark 2 tranquilizer gun. I haven’t killed a single PMC aside from FROGs yet. When I first started the game, there were some bizarre live action segments, like a game show, and an haute couture ad with an octopus. Back to the recap. Snake infiltrated the PMC camp and told Mk. II to stay a little behind him. He used the Solid Eye’s binoculars mode. It allowed him to see Liquid Ocelot across the way. Rat Patrol was nearby, and Meryl called Snake over the CODEC to ask him if he was there to kill Liquid, so he fessed up to it. Meryl said that Rat Patrol couldn’t help because theirs was a peacekeeping mission. A little girl named Sunny prepared breakfast for her friends aboard the Nomad. The second yolk was damaged. While the eggs cooked, she sang a song that consisted entirely of numbers. As Otacon tapped away at the keyboard behind his many monitors, Roy Campbell explained the way the world worked. It shifted from an oil-based economy to a war-based one. Privatized military companies (PMCs) engaged in conflicts with this sole justification. The most powerful PMC, named Outer Heaven, was involved in the conflicts of five separate countries. November 17th, 2009: I was thrilled to find an anime reference with the sword Sesshoumaru. The description reads, “Hurry up and find the damn jewel shards already!” This is a sassy reference to Inuyasha and the shards of the Shikon Jewel that the protagonists must find. I wonder if it was in the Japanese version of the game. In my first review of the monster classes, I was very negligent to exclude one trait: they can’t lift anyone. November 1st, 2009: Taro reported that Etna was in Alche City. Wait, we put one of the kids on recon? “A long time ago, Alche City used to be full of people who knew how to use alchemy,” reported Hanako. Somebody paid attention in school! I was afraid that the city was named that because they were all alcoholics. “But they started doing a lot of bad experiments, and soon everyone disappeared,” continued Hanako. JULY 28TH, 2012: What bothers me the most is that I just don’t like Con2.